New Orleans is a city rich in its history, its culture, and its traditions. It is known worldwide for its food, its music, and its celebrations. 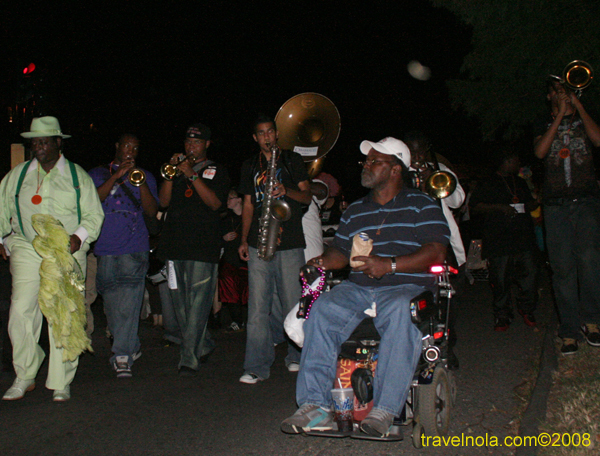 Among those celebrations most unique to New Orleans is the Jazz Funeral. The Jazz Funeral in New Orleans dates back to the early 1800’s. It emerged as a collaborative effort among slaves and free people of color. For these events, people would pool their resources in order to provide a family or community member with a proper burial. The funeral procession was always characterized by the family of the deceased who where the “first line” of mourners, the jazz band, and the “Second Line” --- the non-family members who would come to pay their respect and help celebrate the life of the deceased. Traditionally, the “Second Line” mourners were characterized by their accessories --- fans, handkerchiefs, and umbrellas. All of these items were necessary for the long procession in the hot, southern sun. One the way to the gravesite, the mourners would quietly walk to the slow, somber songs (dirges) played by the band. But once the deceased had been buried, a trumpets call would rally the crowd to celebrate the life of the deceased and help release his or her soul. It is during this jubilant celebration that the fans, handkerchiefs, and umbrellas became “props” used by the Second Liners as they stepped and danced to the celebratory music. Over the course of time, the Second Line Umbrella has emerged as a dominant symbol of celebration in New Orleans. Today, the Second Line Umbrella is used to celebrate just about anything --- Mardi Gras, weddings, showers, graduations, milestone birthdays, anniversaries, retirements, sporting events, etc. With the evolution of their use has come the evolution of their style. What was once just a regular necessity against the sun has become a highly decorated work of art. Second Line Umbrellas now reflect attitude and personal style as they twirl and spin as if to say “laissez les bons temps rouler”! Book your Hotel Room in New Orleans for 2008-2009 Halloween.